Present at the two most recent Olympic Games, very much the player who spearheads her country’s fortunes but on Wednesday 13th June, in her opening contest in the Women’s Singles qualification tournament to reserve places in the 2018 ITTF Challenge, DPR Korea (Pyongyang) Open, it was agony. Iran’s Neda Shahsavari suffered defeat at the hands of Vietnam’s Vu Thi Thu Na by the very narrowest of margins(6-11, 5-11, 12-10, 9-11, 11-6, 11-5, 12-10). Defeat for Iran but there was success; Parinaz Hajilou opened her account by beating Mongolia’s Bolor-Erdane Batmunkh (11-8, 11-6, 11-8, 8-11, 11-8). A notable performance from Parinaz Hajilou; it was the same from China’s Li Jiayuan, she caused somewhat of an upset by overcoming the host nation’s Kim Jin Hyang (11-2, 11-8, 12-10, 11-9), the highest rated player in her group. 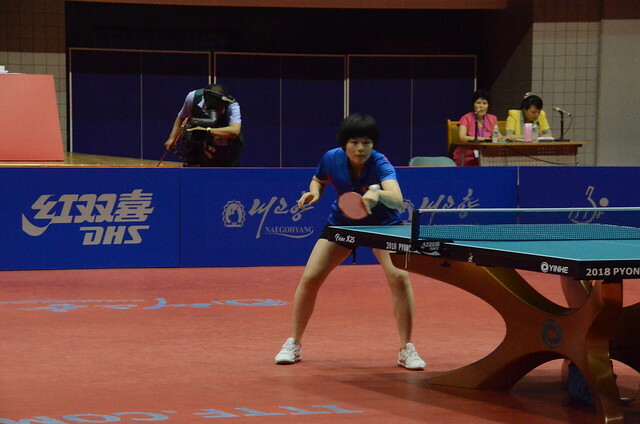 Unexpected but as matters commenced in the Women’s Singles qualification tournament, the results were very much as expected with Vietnam’s Dinh Thi Hang being the player to attract the attention. She accounted for DPR Korea’s Kim Jinyu (11-6, 11-8, 11-5, 11-8). Similarly, in the all host nation contests, Kim Sol Song beat Kim Su Hyang (11-6, 11-3, 11-8, 11-5), Jong Un Ju accounted for Ko Un Gum (11-8, 11-7, 6-11, 11-5, 11-9); in a likewise manner colleague Choe Hyon Hwa overcame China’s Li Yake (12-14, 11-5, 11-2, 8-11, 11-6, 11-7). One match staged for each player on the opening day of action in the Women’s Singles qualification tournament; in the Under 21 Women’s Singles event, proceedings have advanced one step further. DPR Korea’s Choe Hyon Hwa and Pyon Song Gyong duly completed their group stage itinerary unbeaten and in first place in their group; for colleagues Ri Hyang and Ryu Il Gyong it is one played, one win as it is for China’s Li Jiayuan, Li Yake and Gu Juhan. Play in the qualification tournament concludes on Thursday 14th June.